I’m hopping on board and will be going to buy my yarn soon. I am thinking doing a yellow or green yarn. 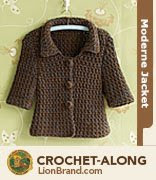 The pattern is only free to download until March 23. Here is the introductory post for their project and here is the post where Heather talks about choosing yarn (you can use different kinds that what the pattern calls for. She explains how to figure it out). If you crochet, join along. I think it will be fun and produce a cute jacket.